Is harmonisation of European securities law a good idea? According to this original analysis, the answer is a qualified yes. If it can be done without undermining the various systems that now govern the custody and transfer of securities in national European jurisdictions, harmonisation will be well received. The author first shows that such an acceptable outcome is indeed possible, and then offers a detailed analysis of the form it might take. Along the way he compares the current infrastructure of securities law in three European countries (Belgium, France, and the Netherlands) with generally accepted standards of modern securities custody and transfer practice, as well as with the harmonisation inherent in the United States Universal Commercial Code. In approaching the actual form of a European securities instrument, the author considers important relevant initiatives taken by various groups, such as Unidroit, the Hague Convention on Private International Law, and some industry sectors. 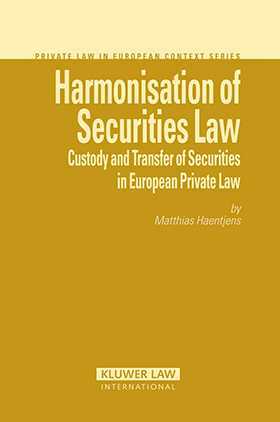 As an in-depth contribution to this important aspect of the ongoing debate about the harmonisation of European private law, and as an assessment of the possible impact of harmonisation measures by means of a coherence account, this book will be especially valuable to European policymakers and securities regulatory officials. It will also interest practitioners and academics in such diverse fields as commercial law, European law, insolvency law, contract law, and property law. Preface. Abbreviations. Part I. Introductory Chapters. 1. Introduction. 2. System and Coherence. 3. Immobilisation, Dematerialisation and the Law. 4. Practice and Risks of the Post-Trade Process. Part II. Securities Laws of Selected Jurisdictions. 5. Belgium. 6. France. 7. The Netherlands. 8. The United States of America. Part III. Harmonisation of Securities Law. 9. Harmonisation Initiatives. 10. National Securities Laws Compared and Evaluated. 11. Harmonisation and Coherence of National Laws. 12. Towards the European Harmonisation of Securities Law. Summary and Recommendations. Summaries in Dutch and French. Bibliography. Table of Cases. Table of Legislation. Index.